1970 Plymouth & 71-72 Dodge B-Body Air Grabber Door. 70 Bbody Air grabber vacuum hose kit - includes mounting clips. 69-72 Air grabber and Ram Air box seal. 71-72 Bbody Air grabber vacuum hose kit - includes mounting clips. 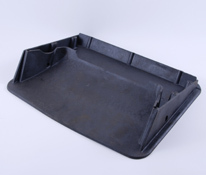 70-72 Bbody air grabber air box. 70-72 bbody air grabber door pins.